We are having difficulty diagnosing some faults on a 2011 Peugeot 5008 with an automatic gearbox. The vehicle suffers from intermittent starter motor operation failure and stalling when selecting reverse gear. 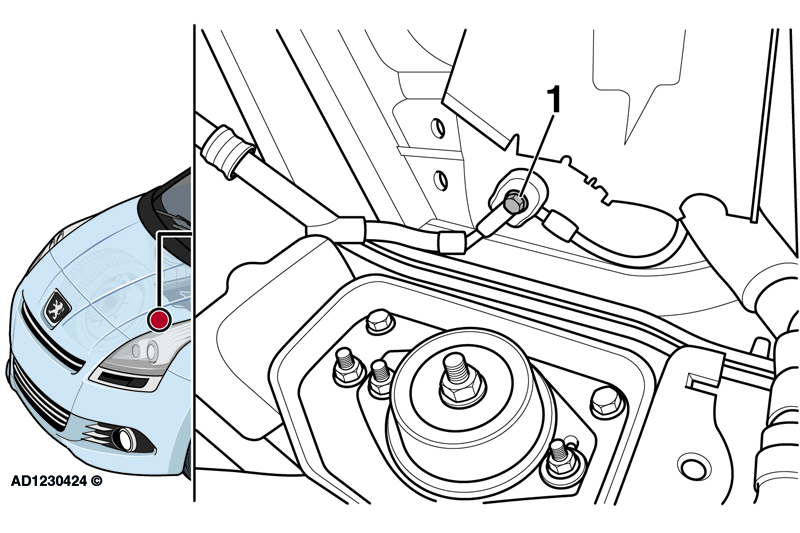 There are some trouble codes relating to transmission shift solenoids (P0972, P0975) stored in the fault memory. We found a poor earth connection on the transmission housing, but cleaning this earth point up made no difference to the faults. Can you help? You have found one part of the fault with the poor earth connection on the transmission housing. The second part of the fault is a poor connection between the earth lead and chassis earth point, due to corrosion. Locate and check the condition of the earth point adjacent to the battery (Fig 2). Remove the battery and battery tray. Inspect the earth lead and earth point. Clean chassis earth point. Fit new fixing bolt to the chassis earth point. Tighten fixing bolt to the correct torque of 10Nm. Clean/tighten battery earth point, on the transmission housing. Tighten fixing bolt to the correct torque of 20Nm. Refit battery and battery tray. Erase trouble codes.